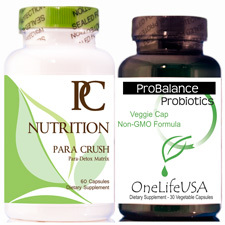 Includes one bottle of Para Crush â€“ Para-Detox Matrix plus one bottle of ProBalance Probiotics. Supports the replenishment of ‘good’ bacteria (probiotics) following the 10 day Para-Detox protocol. ProBalance is a 7 strain, 5.75 billion CFU, Non-GMO in veggie cap formula. Includes the clinically proven DE111 probiotic. Help balance your gut flora and use the ‘Weed and Feed’ approach: Ditch the bad bugs and encourage the good ones. MicroBatched for freshness - Farm to Tablet quality. Boutique family company offering a select group of products. Interested in an all-in-one capsule targeted Para Detox? Followed by a good gut flora probiotics? Then, the ParaCrush kit is a SUPERB choice. Targeted Approach â€“ This kit combo uses the â€˜Weed and Feedâ€™ approach. First weed out the bag bugs then feed with good bugs. ParaCrush is the weed portion. A maximum formula (1485mg) that includes Wormwood, Cloves and Black Walnut. Additionally supportive herbals like garlic, cranberry, pumpkin seed, pau dâ€™ arco, papaya and more are meticulously combined to bring you the preferred blend. The ProBalance probiotic formula is the feed portion. This balanced 7 strain, 5.75 billion CFU, Non-GMO in veggie cap probiotic formula includes the clinically proven DE111 probiotic strain. Qualityâ€“ From raw materials to the finished product: Certificates of analysis, potency verification, fill weight screening, and bacterial, mold & metal testing. All in FDA registered, GMP certified state of the art labs in the USA. MicroBatch manufactured using premium harvests (no artificial colors or flavors) to yield stand out â€˜Farm to Tabletâ€™ products. Unsurpassed Valueâ€“ Don't overpay! We encourage you to compare labels. You wonâ€™t find this superior formula combination for less $â€™s! Trustworthy Companyâ€“ Family company founded by a cancer survivor over 20 years ago. Successfully built a customer service based business using Microbatch manufacturing with premium harvest ingredients to yield â€˜Farm to Tabletâ€™ quality driven products. This product is not intended to diagnose, treat, cure, or prevent any disease. Results may vary. Trustworthy Companyâ€“ Family company founded by a cancer survivor over 20 years ago. Successfully built a customer service based business using Microbatch manufacturing with premium harvest ingredients to yield 'Farm to Tablet' quality driven products. This product is not intended to diagnose, treat, cure, or prevent any disease. Results may vary. Your kit combos are great. 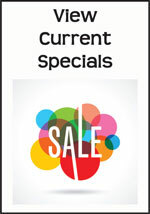 They offer a wonderful savings and put products together that make sense. The Para Crush Kit is one of my favorites. Big fan of your Para Crush Kit. These two products work so well together. Wanted to thank you for the Para Crush Kit. My whole family has used this with great results. Especially like the probiotics.